As investigators attempt to determine the cause of the Transformers 3 accident that sent a 24-year-old extra to hospital with brain injuries, Paramount, the studio behind the film, is suddenly contradicting eyewitness and police reports. 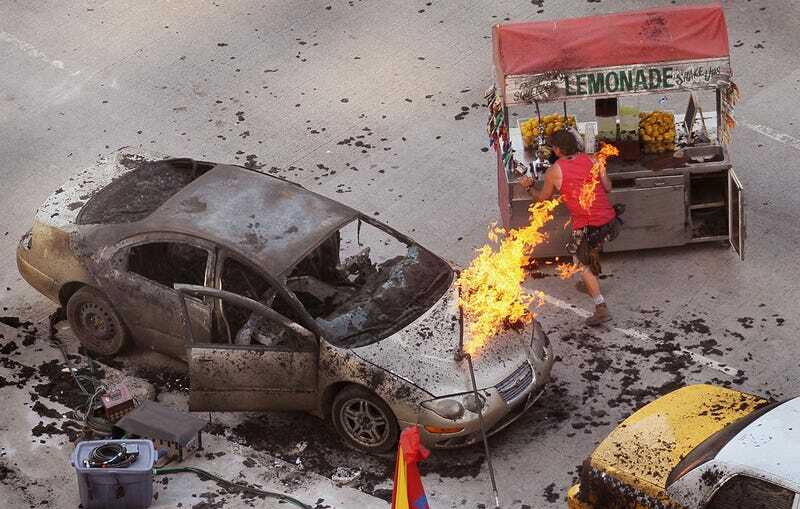 Michael Bay's Transformers 3 was wrapping up filming in Hammond, Indiana — after spending the past few weeks shooting throughout the Chicago-land area (the photo above is from earlier in Chicago shooting, and not from the incident in question) — when a stunt reportedly malfunctioned. The result? 24-year-old first-time extra and aspiring actress Garbiela Cedillo was sent to the hospital with serious head trauma in critical condition. She's currently stable, but reports indicate she's yet to regain consciousness. According to the Chicago Tribune and WLS-TV, both police and other extras say a cable towing another car snapped at high speeds, slicing open the woman's skull and dragging her car (which she was reportedly paid a mere $25 to use) a mile down the road. "The vehicle was being towed by another vehicle," said fellow extra Blaine Baker. "The cable between the two vehicles broke. It whipped around and sliced through the woman's car and sliced through her skull, apparently." Witnesses say Cedillo's car continued moving for almost a mile before it came to a complete stop. So far, news reports and witnesses have continued to report this is what happened. News reports also have said the same stunt malfunctioned earlier in the week. Photos of the aftermath also show her car displaying a large amount of shearing along the side of it, seemingly confirming these reports. But according to Deadline, representatives of Paramount (who is producing the film) say this isn't the case. Paramount just weighed in with me to say that the injured extra was not involved in the stunt, that her car was not involved in the stunt, that a "freak accident caused her injury", that she and her car were more than 500 feet from the stunt, that she was struck by a flying metal object whose welding had come apart and not by a steel towing cable, that the stunt from Tuesday had to be repeated Wednesday because of a "timing issue" and not because it had failed, and that "nobody has done movies more safely than Michael Bay". The studio, however, could not explain why its version of events was so at odds with the local police and media reports. "We feel horrible that anyone was injured and will take all appropriate action," a Paramount exec told me. If this was just a freak accident and the witnesses and police are wrong then it apparently would, in some way, absolve the producers from complete blame. However, if it turns out the witnesses and police are correct then not only is this a tacit admission of guilt but also a fairly callous spin on a mistake they are potentially at fault for. We'll continue to search for answers as to what really happened, while her family and friends gather in person and on Facebook to pray for Gabriela.